“Put your ear down close to your soul and listen hard,” claimed poet Anne Sexton. Yes, those who listen can hear souls. The souls of people…the souls of animals…the souls of places. Places do have souls. The soul of a location is a reflection of its past, a representation of its present, and an anticipation of its future. William Blackmon and Chris Brundrett have found the soul of Texas in the wines they produce at William Chris Vineyards. The two make wines that represent the soul of Texas itself. Texas is known for its independence. The state has flown under six different flags in its history—including being an independent republic for a time—yet has always fought to be its own, unique place. Statements like “everything is bigger in Texas” and “don’t mess with Texas” are still around because they truly show the soul of the state. This stubbornness, this strength, this individuality are all evident in William Chris wines. The characteristics began with Bill and Chris, both good, strong Texans living their wine dreams. They did it not in the way this dream would be lived in France or California, but only in the way it could be lived in Texas...a dream as unique and persistent as these two winegrowers themselves. Chris in the tasting room. Bill has over thirty years grape growing experience in Texas. His agriculture degree at Texas Tech set the stage for him to be a Texas winemaker from the time he graduated in the 1970s. He grew vineyards all over the state before finally settling in Hill Country and planting Granite Hill Vineyards, now a William Chris estate vineyard. Chris is just as much an example of a Texas self-made man. He went to Texas A&M to earn his degree in horticulture and gained experience in wineries all around Hill Country. He helped his own family establish a quality vineyard—Brundrett Family Estate—which also grows estate fruit for William Chris. Though from two different generations, the souls of these two Texans recognized similarities in each other. They formed William Chris Vineyards in 2008 and began the journey to make wines unique to Texas and to Hill Country, to show the soul of the region. They truly believe that “wine is not made, it’s grown,” and they strive to make “wines with soul” that show Texas terroir. Tasting barrel by barrel in the production area quickly showed this soul of the Texas terroir that Bill and Chris strive to display in every bottle. It starts by growing grapes that fare well in Texas, even though these grapes may not be what’s coming out of California. Bill and Chris grow grapes that thrive in Hill Country and the High Plains, like Rousanne, Orange Muscat, Blanc du Bois, Cabernet Franc, Petite Verdot, Mourvedre, and Carignane. These vines love the Texas heat and still withstand some of Mother Nature’s crazy antics every year. They express the headstrong character of Texas. William Chris also shows the soul of Texas hospitality by inviting people to the quintessential Texas tastingroom—a 1905 farmhouse. When renovating and adding to the farmhouse, hundreds and hundreds of shoes were found under the floor. These acted as old-fashioned insulation, and once again, added to the personality of the property. 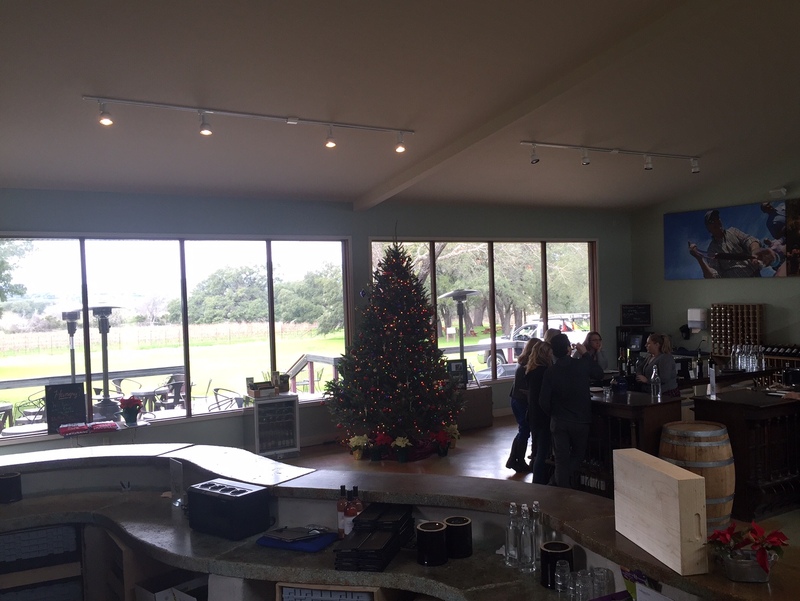 The tasting space has many cozy rooms for sipping, as well as an indoor area with a beautiful view of the rolling Texas hills and an outdoor area for Texas-style picnics. After experiencing this soul and hospitality, choosing only a few wines as super stars is difficult. Every wine sipped, whether from barrel or bottle, was unique to the terroir yet true to the grape…a goal for which excellent winemakers strive. William Chris produces everything from stellar blends, to single varietals, to rosès, to pet nat (petillant natural) sparklers. There are so many excellent examples from which to choose, but here are a few that stood out as exceptional. Shining Star Wine Two: 2014 Carignane—sourced from the High Plains of Texas, the red fruit, tart cherry, and orange pith join the dust and talc on both the nose and the palate of this wine. That dust and talc are a sure sign of the Texas terrior that Bill and Chris like to showcase, one that I enjoyed identifying in many of WC’s wines. Shining Star Wine Three: 2014 Mary Ruth—this is a blend of white grapes: Orange Muscat, Blanc du Bois, and Muscat Blanc. The nose is full-on sweet honeysuckle, yet the palate is surprisingly filled with fresh flowers. A light yet complex wine that would pair well with a Texas afternoon or a cheese plate, it is a worthy example that shows Texas can produce quality whites, too. Shining Star Wine Four: Tatum Rosè—yes, another rosè makes the list of shining star wines, perhaps showing my bias for the color pink. However, this pink is the prettiest shade of barely-there, baby pink. This is assistant wine maker Josh’s “baby,” his special project for the tasting room. It is even named after Josh’s baby, his daughter Tatum. It is a wonderfully dry rosè that would give any Provence pink a run for its money. William Blackmon and Chris Brundrett put their ear to the ground of Texas. They listened to the land. They listened to their vines. They listened to their surroundings. They listened to their customers. In doing so, they found the soul of Texas wines, the soul that shows in each unique bottle of William Chris wine. By putting their hearts into their home state of Texas, they found the soul of the Texas wine industry.